We all know the history of Syracuse, at least in a general enough sense to know the city grew most rapidly as a result of the Erie Canal; and most of us realize that the canal was a centerpiece downtown, its route traversing the city following the path that has since become Erie Boulevard. But, did you know that the canal is about to be resurrected at one of its most important points along its entire route, right in the heart of downtown? Ok, so "resurrected" might be a bit of an exaggeration, but the canal's location and significance are about to be celebrated via a massive public art installation in the coming weeks. 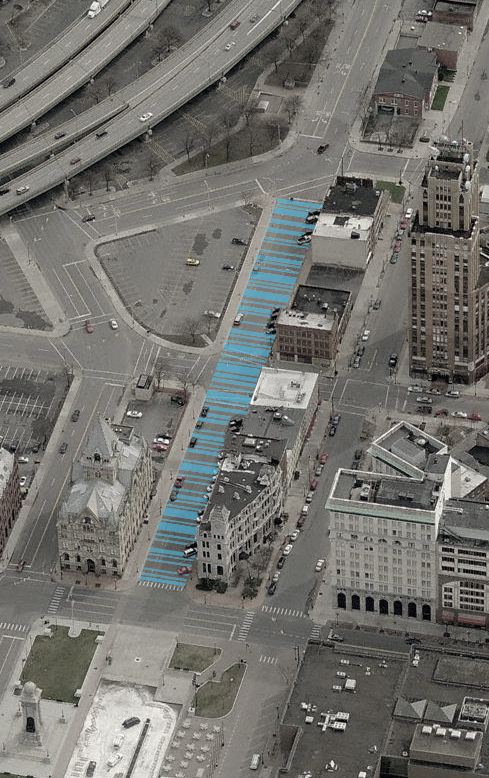 Spearheaded by the Public Arts Task Force with the support of the Erie Canal Museum, a two block stretch of Erie Boulevard will be painted blue -- the actual width of the former canal it replaced -- effectively connecting Clinton Square and the museum with a highly visible interpretive street mural. The pattern resembles a bar code from above, but when viewed on the street level, it evokes the shimmering, subtle movement of water in a contemporary fashion. The project, entitled arterie, is intended to be complete in time for interaction during the upcoming Syracuse Arts & Craft Festival. The Bull and Bear Pub is hosting a fundraiser for the project on Wednesday, July 27th with all tips from 5:30 to 7 supporting the project, and canal trivia beginning at 7. Join us on Friday July 29th from 5 to 8 for the arterie opening celebration at J. Ryans Pub and all along the adjacent two-block stretch of Erie Boulevard! Keep an eye on the evolving arteriesyracuse.com for information about the project throughout the process. UPDATE: The paint is hitting the pavement! Visit the PATF facebook page for photos of the project's progress. Hi Jason - I met you at the Regional Market today and saw the canal picture on the phone. Since you gave me your card I looked it up on this website. It is really beautiful and so much more impressive when you can see the entire view. Nice work! Thanks! It turned out even better than we could've imagined -- I'll have a post in coming days with photos and reactions.